Deedy conferred with our boss late last night. To rev up her brain so she's ready to write. Flash! We've muscled our way back into our own blog. To do all the tasks S. C. asks of Elves Izzy. Yet another book from Deedy that is NOT about us!!! Yup. Deedy's done it again! She's published a new book that is 100% Izzy Elf free. (On the other hand, she has promised to help us write this year's Izzy Elf Advent Calendar-type posts (in verse) starting on December 1. She also keeps hinting that there is a BIG SURPRISE coming soon that is definitely about one of us, although she is not sure she can figure out the technology to do whatever it is. We're all buzzing about it. So, meanwhile, here is what Deedy has to say about her new NON-Elf book! I am so very happy to announce a brand new book! 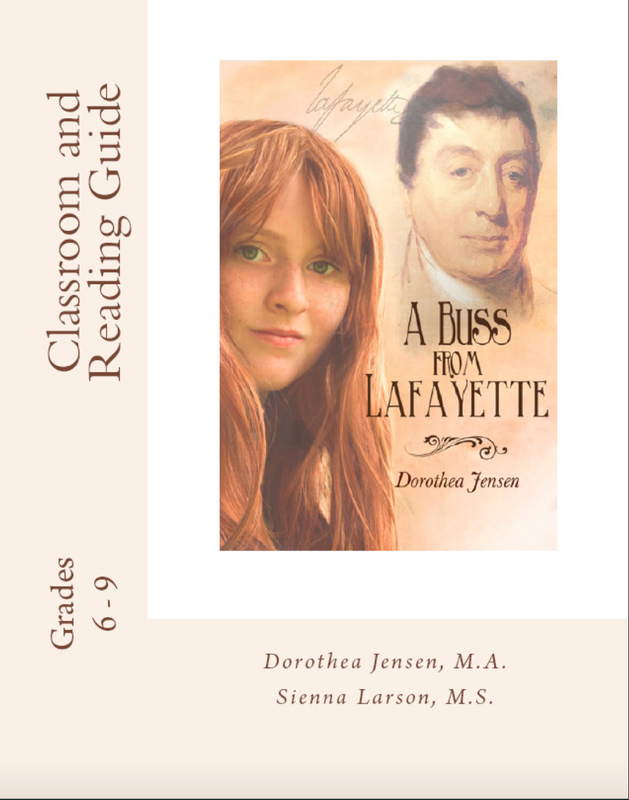 Along with my colleague, Sienna Larson, I have written a guide to make it super easy for teachers to use my new historical novel for young readers, A Buss from Lafayette, as a cross-curricular enrichment resource in the classroom! This guide provides bulletin board ideas, vocabulary exercises, varied handouts, puzzles and games, reading comprehension quizzes, discussion questions, individual and class project suggestions, cross-curricular activities (language arts/reading, social studies, mathematics, heath/safety, art, music, dance, drama, food/recipes) and suggestions for real and virtual "field trips. "Topics covered include the American Revolution, Lafayette's role in our fight for independence, Lafayette's Farewell Tour in 1824-5, and everyday life and customs in rural America in the 1820s. A complete answer key is included. This guide is now available as both a paperback and as a Kindle book from Amazon.com. Now I must admit, a few of the things (mostly musical recordings) promised inside this book are not quite yet available as promised at abussfromlafayette.com. However, we will be making all these recordings very soon. In case anyone out there is wondering how to print the handouts/exercises from the Kindle edition, we recommendation making a screen shot of the page and printing from that. We found this to be even easier than copying from the paperback edition. Whenever I write historical fiction stories, I present what really happened in the past as accurately as I can. Sometimes, however, it is tricky to keep track of where I found every single bit of information I use in my stories. In A Buss from Lafayette, I had lost track of the source of two small incidents I used to illustrate Lafayette's marvelous sense of humor. Along with his enduring commitment to the cause of Liberty, his personal bravery in battle, his financial support of the war, his go-between efforts to make the French Alliance work and secure even more aid, I have always believed Lafayette's humor was a major contribution to our struggle for independence. His humor and charm were wonderful antidotes when things looked very bleak for our cause. In some ways, I think he was the Morale-Booster-in-Chief! Here is a case in point: imagine how Washington felt after the Battle of Brandywine, on September 11, 1777. He was desperately trying to prevent the British from capturing Philadelphia, a sort of Capital Pro Tempore for the 13 colonies because the Continental Congress met there. Not only had he been hoodwinked by Tory locals about the existence of upstream fords on Brandywine Creek where the British crossed to outflank his troops, but his men lacked the training to deal with such a maneuver. At Midnight, Chester [Pennsylvania], September 11, 1777. Sir: I am sorry to inform you, that in this day's engagement, we have been obliged to leave the enemy masters of the field. Unfortunately the intelligence received of the enemy's advancing up the Brandywine, and crossing at a ford about six miles above us, was uncertain and contradictory, notwithstanding all my pains to get the best. This prevented my making a disposition, adequate to the force with which the Enemy attacked us on the right; in consequence of which the troops first engaged, were obliged to retire before they could be reinforced. . .Notwithstanding the misfortune of the day, I am happy to find the troops in good spirits; and I hope another time we shall compensate for the losses now sustained.. ."
One of those whose good spirits Washington found cheering was Lafayette, who had been wounded in the leg in the battle. "Lafayette returned to America in 1824 for a triumphal tour. The French hero was greeted enthusiastically in many cities. And perhaps no city loved him more than Philadelphia, the place where the 19-year Frenchman initially met General Washington in 1777 shortly before the Battle of Brandywine. The ball went through and through; I was on foot when I received my wound; a part of our line had given way but a part still held its ground. To these I repaired. To encourage my comrades, and to show them I had no better chance of flight than they, I ordered my horse to the rear. The news of my being hurt was conveyed to the commander-in-chief, with the usual exaggerations in such cases. The good General Washington freely expressed his grief that one so young, and a volunteer in the holy cause of freedom, should so early have fallen; but he was soon relieved by an assurance that my wound would stop short of life, when he sent me his love an gratulation that matters were no worse. On the field of battle the surgeon prepared his dressings, but the shot fell so thick around us, that in a very little time, if we had remained, we should both have been past all surgery. Being mounted on my horse I left the field, and repaired to the bridge near Chester, where I halted and placed a guard, to stop fugitive soldiers, and direct them to join their respective regiments. I could do no more; becoming faint, I was carried into a house in Chester and laid on a table, when my wound received its first dressing. The general officers soon arrived, when I saluted them by begging that they would not eat me up, as they appeared to be very hungry, and I was the only dish upon the table in the house. The good general-in-chief was much gratified on finding me in such spirits, and caused a litter to be made, on which I was conveyed to the Indian Queen [a tavern/hotel] in Philadelphia, and was there waited upon by the members of Congress, who were all booted and spurred and on the wing for a place of greater safety to hold their sessions. The enemy continuing to advance, I was removed to Bristol, and thence in the coach of President Laurens (and coaches were rare in those days) to Reading [here Lafayette's memory fails him — he was actually moved to Bethlehem], where I remained until so much recovered as to be able to repair to head-quarters."